Spring has officially sprung, hooray! Since it was a beautiful day Sunday, I was inspired to open the windows and start an Easter project! I absolutely love topiaries! 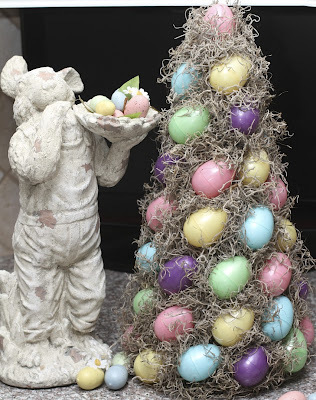 And, I've always admired the Easter topiaries at Pottery Barn. So, I decided to create my own! I started with a Medium-Sized Rattan Cone for the base. You could also use a Cone Form; I chose rattan for stability. First, I created a pattern with the eggs (I alternated the colors/pattern as I worked my way up). Next, it was time for glue! 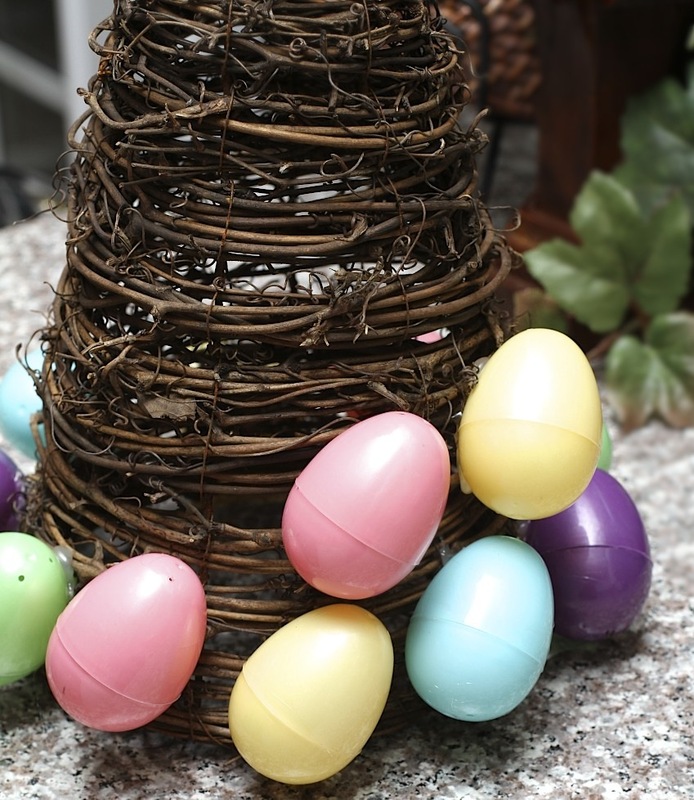 Make sure to apply the glue directly onto the egg and hold firmly until glue sets. The eggs were placed at a slight angle, all facing the same direction. I left small gaps in-between each egg for the "future" moss. I started at the top when adding the moss, for no particular reason. I added generous amounts of glue in-between each egg and pressed firmly onto the moss until it was anchored. I wrapped the excess moss around the adjacent eggs. Once the moss was set and in place, I gave my topiary a little trim! To compliment my little tree, I added Mr. Bunny! He was a fantastic TJ Maxx find! To add a bow, or not to add a bow, that's the question? Love your topiary! and Mr. Bunny too. How pretty! I have lots of plastic easter eggs, I might try to make this today! Great project! Wow! I am so impressed--this is too cute. I'm not so crafty (I do cook) but I surround myself with crafty people. I think I just might attempt this. I love topiaries and this is just adorable! Thanks for the visit and I'm now one of your newest followers. I've enjoyed my visit here. Now that is just lovely! I am amazed by all the talented bloggers out there in blogland! 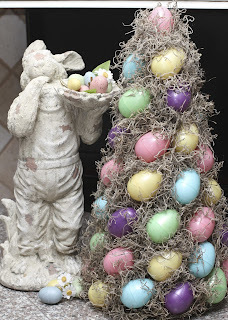 So creative and so cute for Easter. Thanks for sharing at my Swing into Spring party. This is such a pretty tree! So creative! Hey Lindsay from countrygirlhome. Thanks for stoping by my blog and for the kind comments. I am gald I came by your blog has so many cute ideas. I am now a follower! 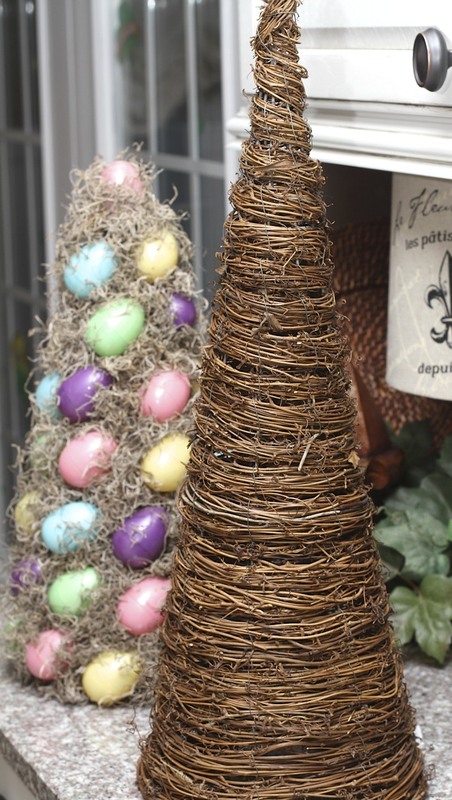 Hey Also I have been looking for wood trees(cones) for ever It says you got them from the Flower Factory-where is that? What state? Oh I wish I had some of them!! 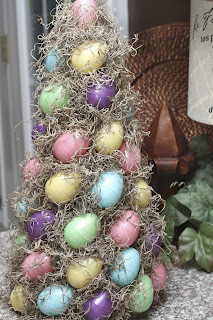 Darling easter tree. I linked up from WUW and this is just gorgeous. This will provide years of gorgeous fun. Mr. Bunny is fabulous too, just the perfect touch. Thanks for the wonderful tutorial. What a cute idea! So cheerful and fun! This is so darn cute! I think the moss is what pulls it all together and makes it rich looking. I wouldn't add a bow, it's perfect just the way it is. Jodie, so nice to have you as a new follower! I am now following you back! Can't wait to see more of you! I'm your newest Follower returning the visit from SomethingCreatedEveryday.blogspot.com. I love your Easter Egg Topiary. Very cute and very easy. I love this, this is great!!! Thanks for a nice tutorial too! Love your topiary. This looks like something I could do! This is my first visit to your blog and I'm now a follower. Come visit me and follow me, too! I just found your blog and am your newest follower. This tree is so cute -- I LOVE IT! Thanks for the practical craft ideas and fab inspiration. I think it's perfect just the way it is! Thank you SO MUCH for linking up to WHASSUP WEDNESDAY!!! Great entry:) BEYOND adorable! This is such a cute idea! You are so creative. I'm going to have to try this. I love it! I may try that with a solid color egg - maybe robin blue or a muted gold.. Thanks for stopping by my blog today...and now I have found you! This is so cute. My daughter and I will try to make this for our Easter decorations. So clever! Great project!!! Hey, did you change your header, it looks different to me, I really like it! Such a creative idea! I love how it turned out...darling!!! So pretty, Jodie! Thanks for stopping by my blog yesterday and leaving a comment. Have a wonderful weekend! Wow, love how the moss gives it such a softened look. I would say no bow, but that's just me! :-) Thanks for linking up! I love how cute this turned out! I featured it on my blog today, please feel free to swing by and check it out. Happy Sunday! Fun tutorial! I love how it turned out! Jodie this turned out precious! I love it! 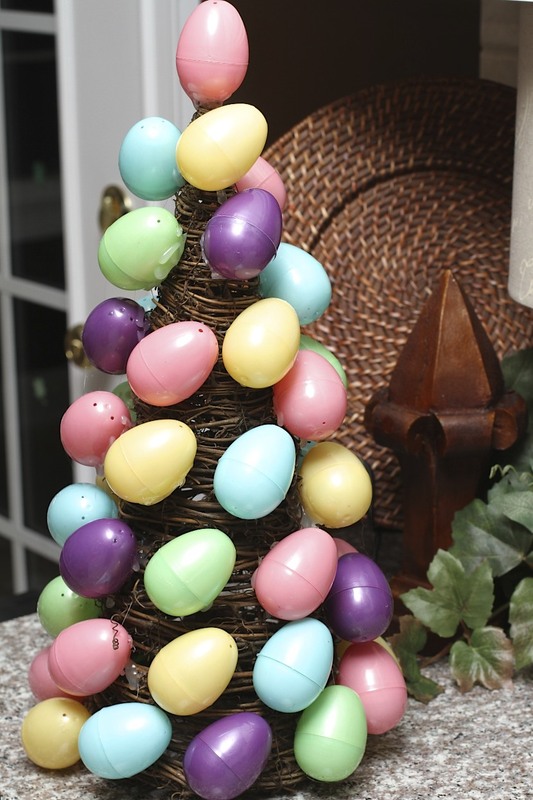 Your egg tree is adorable! !I'm your newest follower-stop over for a visit!! Super cute! I featured this on Hoo's got talent! Thanks for linking up to the party! Very nice! 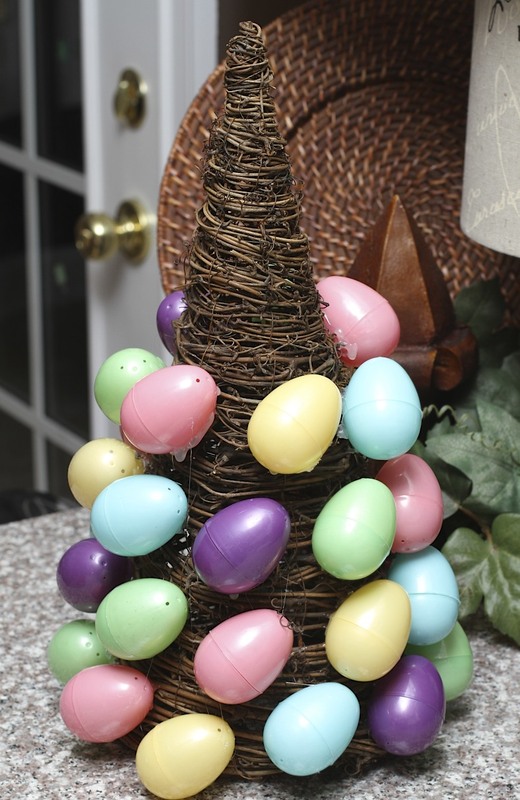 Great idea for an Easter decoration . . . thanks for visiting my blog . . . I love your blog!! I'm your newest follower. I can't wait to read through more of your posts. Thank you so much for becoming a follower at Welcome to Heardmont! I LOVE this tutorial. You really made a Pottery Barn look on a much less expensive budget. :) Great job - makes me ready for Easter! Nice topiary! Great minds think alike. Thanks for stopping by today. I'll be following you too in blogland and on Twitter! Love the Easter Tree! I think I would like it with or without a bow. It is as cute as a button! Hi! I've featured you on my Make Something Mondays Link Party this week! Thanks for joining...come grab a button!! I love your egg tree and the directions are wonderful. Mr. Bunny is adorable. I love this! I have a bunch of moss leftover from another project...maybe I have a use for it now :) Thanks for visiting my blog! What CREATIVE Easter ideas! You definitely have a talent! You inspire me! So cute!!! Visit me..Simple Pleasures! I just adore this topiary! 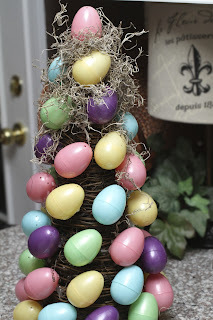 Just wanted to pop in and let you know that I included it in a Easter decoration round up on my blog (http://www.vlhamlin.com/diy-projects/10-diy-easter-decorations/) Hope that’s okay!